Ely Stage Stop & Country Museum (ESSCM) continues to grow. The October article gave readers a first year’s review of activities. Things have not slowed down since then. Fulfilling a promise made during an April visit to the ESSCM, Congressman Mike Thompson returned to the museum on October 15 to present a United States flag that was flown over the Capitol Building in Washington, D.C. Thompson feels at home at the Ely Stage Stop and fully supports the museum’s efforts to preserve a special part of Lake County’s history, providing a showplace for life in the early times of the county. It was an honor to have him in attendance as the flag was raised for the first time at the museum. The Farm to Table Winemaker Dinner, in partnership with Wildhurst Vineyards, was a huge success in October. The event sold out early and many of those who missed out asked to be placed on a waiting list for a hopeful second such event. The museum has proven itself to be a desirable setting for intimate gatherings and will host future fund raising events. Barn building continues although winter rains have slowed the progress. The local community came forward and donated additional monies to help with roofing materials. Volunteers were able to install 3/4 of the metal roof before the rains hit. The County Building Inspector has given the green light for putting the wrap on the exterior, a prelude to starting the siding. Once the exterior is finished, the barn interior can be populated with the Lake County Historical Society’s collection of artifacts and can also be used as an event destination. 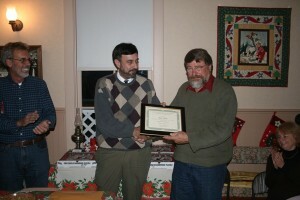 A dinner was held on December 1 at the Stage Stop to honor the docents who volunteer their time. Weeks prior to the dinner, the docents submitted their individual votes for the first Docent of the Year Award. Lake County Historical Society President Phil Smoley presented the award to Bill Lane that evening. Bill’s exceptional contributions of time and energy were enthusiastically recognized by his fellow docents. Everyone who visited during the holidays got to enjoy the museum decked out for Christmas. Docents gave a grand Old Fashioned Christmas look to the Stage Stop. Prospects for early 2013 include a return of the Science and Museum Camp in the spring. Watch for various fund raising activities such as a Trash and Treasures “Yard” Sale, a Mother’s Day Tea, and possibly a Quilt Show. Be sure to visit the Lake County Historical Society’s and the County of Lake’s newest museum. The museum address is 9921 Soda Bay Road (Hwy 281) in Kelseyville (near Clearlake Riviera). Current hours of operation are 11:00 AM to 03:00 PM each Saturday and Sunday.